05/03/2012Two lightning-triggered wildfires that have charred 24,000 acres in drought-stricken West Texas threaten 150 homes and 250 other buildings, officials said Wednesday. "We're going to do everything we humanly, safely can do to protect those homes and residents," Incident Commander Tony Wilder said. Jeff Davis County officials ordered voluntary evacuations, but residents have not left some neighborhoods, Texas Forest Service spokeswoman April Saginor said. About 250 firefighters, including "hot shot teams" from Arizona, Nevada and Georgia, are on the scene to battle the two blazes in steep, rugged terrain, Saginor said. The leading edge of the Livermore fire, which has burned 13,387 acres since last week, is within a mile of the Davis Mountain Resort community, fire officials said in a statement Wednesday. The fire is about 30% contained, it said. "Winds associated with afternoon thunderstorm activity are making the firelines difficult to hold," the statement said. The Spring Mountain fire, which is 60% contained, has burned 10,576 acres northwest of Fort Davis since starting April 24, it said. "We've had about one-fourth of the moisture that we normally get," fire volunteer Kelly Bryan said. Malibu resident Cameron Wellwood was reminded of the 2007 fire after candidates spoke on fire safety. OROVILLE, Calif. — Oroville firefighters quickly knocked down a fire that was burning on the south side of a house on Acacia Lane at about 10:47 a.m. Tuesday. Engine 1 was just a few blocks away. Capt. Dave Hilson said the fire was burning in rooms on the south side of house when they arrived. Firefighters extinguished the fire a few minutes after they arrived. No one was at home at the time. Firefighters ventilated the house to release heat and smoke and another crew searched the house and found an unconscious dog, which was rescued resuscitated with a dog oxygen mask and taken to a vet, said Oroville Battalion Chief Dean Hill Jr. by telephone later. "I think he is fine, but he took in quiet a bit of smoke," Hill said. Fire was contained to the living room, but smoke damage went throughout the house. The Oroville Fire Department is investigating the cause of the fire. Wildfires have already scorched thousands of acres, destroyed rural homes and caused two deaths in the Plains and Upper Midwest. Firefighters work at extinguishing a brush fire in the state-owned Nevin Springs Fishery and Wildlife Area in Fitchburg, Wis. on March 20SIOUX FALLS, S.D. -- Although warmer weather is being embraced by many snow-accustomed residents in the Plains and Upper Midwest, the unseasonably dry conditions have turned the region's vast grasslands into a tinderbox. Wildfires have already scorched thousands of acres, destroyed rural homes and caused two deaths. The region's early start to wildfire season was brought on by a "vicious cycle" of weather patterns, explained Beth Hermanson of the South Dakota Wildland Fire Suppression Division. Three years of excessive snow and rain fed grass growth before this winter's relatively light snowpack, which left grass standing 4 or 5-feet tall in some areas dried out — creating perfect fuel for wildfires. "This time of year that's very unusual because normally we get that snow cover and it lays (the grass) down," Hermanson said. "There's a lot of fuel to burn out there, which is a recipe for disaster as far as fires go," added North Dakota Forest Service fire specialist Ryan Melin. Plus, the nice weather is luring people outside. 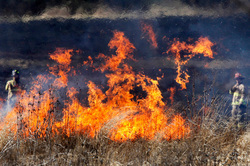 Experts say the majority of grassfires are sparked by humans. Fire warnings were issued Wednesday in North Dakota and Wisconsin because of strong winds and dry conditions, while a burn ban in Minnesota is taking effect Monday. Several states spanning from Colorado to Missouri were under similar warnings earlier this month. In the last week, a wind-fueled grassfire in eastern Colorado injured three firefighters and destroyed at least two homes as it charred across about 37 square miles. A North Dakota farmer lost his home to a similar fire, and two deaths were attributed to grassfires in Wisconsin. Such fires — fueled by wind, feeding on dry grass — are hard to manage. And the blazes become even more treacherous to fight when they spread across hills, valleys or creek beds because they can quickly split and move in different directions, Hermanson said. "It's very easy to get trapped in a bad situation," she said. Melin said North Dakota averages about 500 grassfires a year, but he expects far more this season considering dozens have already been reported. He also noted that two consecutive springs of heavy rain and flooding dampened grassfires but also spurred excessive vegetation growth. "This year, my gut feeling is we're going to be quite a bit above that," Melin said, adding that about 90 percent of such fires are sparked by humans. "We've had a ton of fires and multiple large-scale events of over 1,000 acres." In Missouri, several fires burned across about 8,500 acres during six days in early March, including three that were each responsible for charring more than 1,000 acres, said Ben Webster, fire program supervisor for the Missouri Department of Conservation. "We had a drought last summer, and we never fully recovered from it," Webster said. "Without any kind of moisture this winter and then very early dry weather, it really just all came together." Several weather factors combined to add to the fire threat this month: temperatures in the 70s, clear skies, low humidity, and wind gusting 40 to 50 mph. The warm weather also lured many people to work in their yards, he said. "Fires get away from folks," Webster said. "A lot of it was careless use of fire, burning trash, burning yard debris." In northwestern Wisconsin, fire officials are worried about hundreds of thousands of trees that were topped during a windstorm last summer that left about 2 million cords of wood on the ground — equivalent to a year's worth of logging. The Department of Natural Resources, the National Guard and loggers have been racing to get as wood off the ground, but they've cleared only about half of the timber, said Steve Runstrom, the DNR's St. Croix Area forestry leader. The tangles of logs and brush have made it nearly impossible to walk through the woods or bring in heavy equipment, he said. If a fire starts, firefighters would be forced to fall back to defensible positions such as roads or lakes, raising the threat for the thousands of homes, farms and cottages across the region.